This coloured aquatint was made by Robert Havell and Son from plate 7 of JB Fraser's 'Views in the Himala Mountains'. 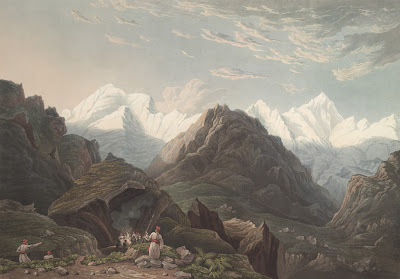 While crossing the mountain pass between the valleys of the Ganges and Yamuna rivers, on their way to the source of the latter, Fraser and his party spent a night at this spot. It is named after Bhima, one of the five Pandava brothers in the epic Mahabharata. Fraser wrote: "Our encamping ground was ... a cave under a large stone, called Bheem-Ke-Udar; in a dry night it is sufficiently comfortable, but rain would readily beat in. In this cavern, and under a few other large stones around it, there was some shelter, though scanty for our company."